Based on multiple attempts, I’ve determined that I am not a confectioner. I’ve tried to make different candies and such, but things more often than not go sideways. This isn’t a bad thing, necessarily, but it is an interesting limitation to know and try to overcome. The opportunity presented itself in the run up to New Year’s Day, when we were getting ready to have people over for hoppin john, cornbread, and a house blessing. Line an 8×8 pan with buttered foil. Combine condensed milk and chocolate in a large glass bowl or 4-cup measuring cup and melt in the microwave at 50% for about 3 minutes, stirring frequently. As soon as the chocolate is melted, stir in the vanilla (and nuts, if using), and pour into the prepared pan. Refrigerate to cool and set. Once set, remove from pan, peel off foil, and cut into squares. Since I used mainly semisweet, and not milk chocolate, this set up really firm. Not too hard, but definitely on the firm end of the fudge spectrum, especially when it was kept in the fridge. I was worried that it would be grainy because I overstirred it, trying to make sure the chocolate was all melted (and to keep the sugar crystals small, which is what gives fudge its texture) and it started to look curdled. I didn’t need to worry–the sugar in the condensed milk is already entangled with the milk proteins, so can’t form large crystals. The curdledness disappeared when I poured it into the pan, and didn’t affect the final texture. It went over well with all the guests, so I would say it was a success. Finally, I’ve managed to conquer fudge. Not that it’s something to make every week (or month, even), but it is nice to have a quick and easy sweet treat recipe on hand. The twins spend a lot of time with the track/cross-country team at the kids’ school. They aren’t old enough to participate, but, since we help out with practices, they wind up being sort of honorary members of the team. This year, since their birthday was on the last day of practice before the final cross-country meet of the season, they decided they wanted to share cookies with their best buddies on the team. Specifically, they wanted gingerbread angels. I wound up baking two batches, because we determined one wouldn’t be enough for the entire team, plus younger siblings who had been invited to the final practice, plus any adults who were there volunteering to help out. After I counted out the five dozen for practice, there were just enough to spell out “Happy Birthday”, plus their initials. This turned into the dessert to share with one of their godfamilies (the other family couldn’t make it). I modified the King Arthur Flour gingerbread cookie recipe by amping up the spices. The original recipe calls for 2 tsp each of cinnamon and ginger, and 1/4 tsp cloves. Because we like a spicy gingerbread, I doubled the ginger and cinnamon (4 tsp each), and put in 2 tsp cloves. I also added about 1 tsp finely ground black pepper. I also used whole wheat flour, and added some additional to try and get a stiffer dough. Really, this dough does need to chill so that you can roll it–the added flour didn’t actually do anything for the first batch. However, once it is chilled, it rolls really easily. 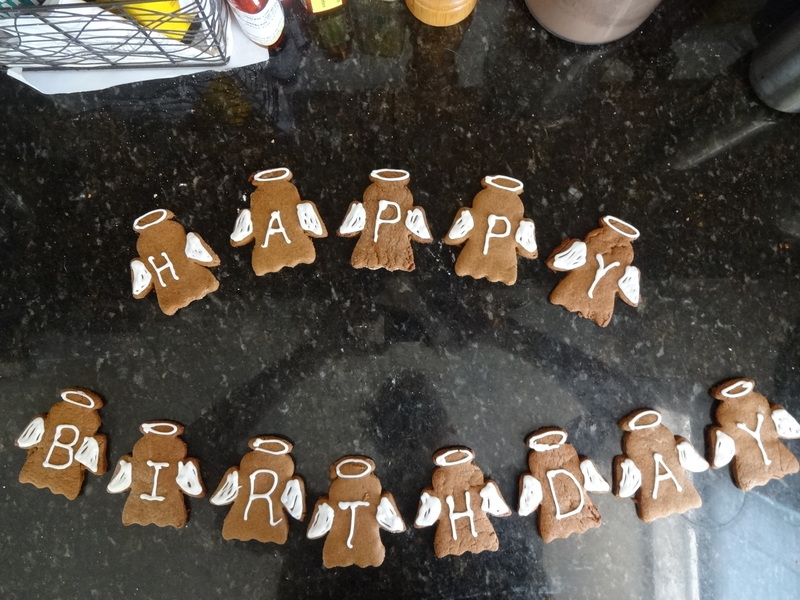 Because the twins wanted the angels decorated, and because I was a little worried the cookies would be too assertive for a more general population, I went with the Serious Eats royal icing recipe for the halos and wings. This recipe is easy to make, and really does pipe smoothly. It doesn’t taste too bad, either. The final verdict? A smashing success. The twins were very happy to share the cookies with their friends, and delighted when we pulled out the Happy Birthday batch after dinner. The cross-country team loved the cookies, even if they were on the spicy side. So, happy kids all around, and I have a good gingerbread cookie recipe all set for the upcoming Christmas baking season. Cats like routine. Lavash and Benson are our secondary alarm clocks–they know breakfast is at 0600, so start to get worried and make noise at about 0530 if we aren’t up and moving by then. Lavash gets annoyed when we come in the back door when we get home from mass, since that messes with her plan to flop down on the carpet by the front door for belly rubs. Curiously, this only happens on Sunday, so I suspect belly rubs are part of her after post-post breakfast nap routine. Benson likes Saturdays since I almost always make pizza. Not only does he try to steal a slice, or select toppings (like kale), he gets to hang out on top of the cabinet above the refrigerator. I assume the view must be pretty good from up there, especially as a look-out spot for dropped pizza toppings of interest. Ikinji recently turned nine, and we had a board games-themed party for him and a few of his friends. Fortunately for us, only a couple of his friends were able to come– I think the noise level gets exponentially louder with each additional guest, especially after they’ve had a nerf gun battle at the park nearby. In any case, keeping with the theme, I made a checkerboard cake. There are surprisingly few tutorials online for how to do a rectangle checkerboard. There are plenty for circular cakes, since it won’t matter which side you cut into–each wedge of cake will have the pattern, which is usually made by cutting concentric circles out of your cakes and fitting them back together in an alternating pattern. For the rectangular cake, I cut strips of cake, approximately 1″x1″x9″ (the width of the cake) and stacked them alternating yellow-chocolate-yellow. 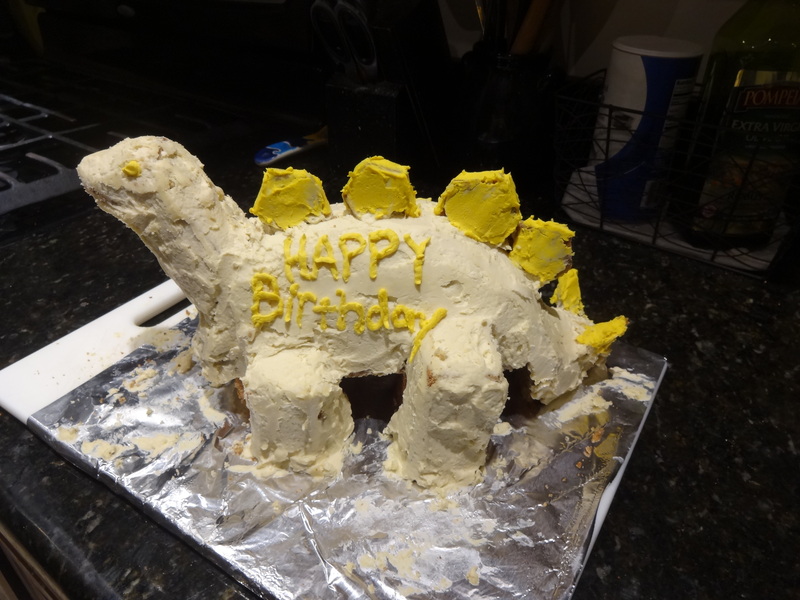 I used seven minute icing to stick the pieces together (and stick they did!) and german buttercream to frost the outside. Checkerboard around the outside hints at what’s inside. The top, by the way, had a chess piece piped on in chocolate. As an added wrinkle, my wife suggested that each slice have a 9×9 grid, so that you could play tic-tac-toe with white and dark chocolate Reeses Peanutbutter Cups. This required marking the outside with where the pattern repeat occurred. I used a thicker line of icing for the outside checkerboard to indicate where to cut. While it isn’t an exact match to the inside, this actually worked out pretty well. Checks on the outside, checks on the inside. This is after most of the cake has been cut and eaten, hence the messy cake board. What surprised me most was how quickly this came together once I had figured out how it would come together. I had to bake two 9×13 vanilla cakes to get enough of the white, and one 9×13 chocolate. If I had it to do over again, I would have cut .75″ rectangles to allow for loss during cutting, and to have a slight margin of error. As it was, I had to use a leftover frozen chocolate cake for the last strip. Still, the cutting and assembly went very quickly. 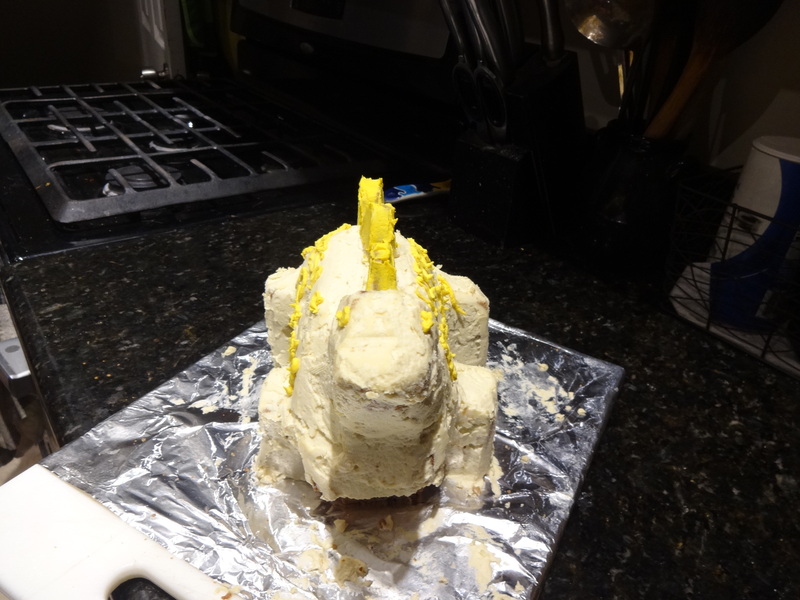 Also, since the frosting on the outside wasn’t too elaborate, that came together rapidly as well (which was a good thing, since I was frosting it the morning of the party. The final product elicited the desired effect: the boys were impressed, especially Ikinji, who didn’t know what we had planned. The kids’ parents were pretty impressed, too, but the “Wow, neat!” I got from the kids was well worth the effort. Unlike last year’s very rushed birthday cake, I left myself plenty of time this year to make my cake. I took the entire week off work, mainly because we were coming back from Colorado, but also to ensure I would have some time to work on this year’s recipe: Russian Honey Cake, or Medoviy Torte. When I was in Dushanbe, the Korean-Tajik ladies who ran the (tiny) cafeteria would serve this daily. We would also get it in Turkmenistan, but it was less common there. After I saw the recipe on Smitten Kitchen, I knew I wanted to try and recreate it. As I said, I gave myself plenty of time to work through this one. I was prepared for an honest-to-goodness full day marathon of working in a hot kitchen. I even recruited Ikinji to help. I mean, the recipe includes a stovetop portion before you even roll out the layers and bake them. As it turns out, the actual flow of the recipe is not that difficult, and it goes pretty easily. Even though I had Ikinji help with trimming the layers into perfect rounds (by tracing around a plate) one person can easily do everything. The main change I made (other than using whole wheat flour, which I do in everything (except angel food cake)), is to use greek yogurt instead of the sour cream. At least one of the comments on the recipe aludes to the fact that Russian (and post-Soviet territory) sour cream is much, much thicker than what we get. It really is much closer to greek yogurt (that is, yogurt that has had most of the whey drained out) than the sour cream you buy here. Also, rather than using sweetened condensed milk, I wanted more of a honey flavor, so I wanted to sub all honey for the condensed milk in the recipe. Well…I only had about half the honey I needed, but I went with it anyway. This made the icing not nearly as runny, and not nearly as sweet. I would call it a success. I do want to try it again with the correct amount of honey. Even though it was ready for my birthday itself, due to outside circumstances, we didn’t get around to eating it until two days later. By that time it was almost too dry, since the layers had absorbed all the available moisture. Taste-wise it was great, but the texture was a little off. Still, since it isn’t as difficult to make as it would seem just by reading the recipe, I think it might be making a reappearance. Half the cake gone..showing off the layers. Probably a little too thin, but good nevertheless. Or, how to make yogurt and buttermilk at home. We’ve made our own yogurt for several years now now. It’s cheap and easy, especially when you don’t rely on commercial starter culture, but rather yogurt from the store as a starter. My current batch has been going for over a year now, almost two. In Liberia, we had a culture going for a solid two years without any problems. I’ve used a couple of different methods, but the key is to control the temperature of both the milk and the environment for the culture to work. In Liberia, we used whole cream powdered milk (which is nearly impossible to find at a reasonable price here). I would reconstitute it at about one and a half strength, using water at about 115 degrees. The goal is to have the milk between 110 and 115 degrees when the yogurt culture goes in. I then put this container in a cooler with a damp dishtowel that I had warmed in the microwave, and leave it over night. After a couple of hours in the fridge, the yogurt had set quite nicely. Lavash helping check the temperature. The cats love when I make yogurt. Currently, I use whole milk from the store. Even though I don’t need to pasteurize it (in Ashgabat, since we bought milk in the market in 1-liter bottles pasteurization was a necessary first step), I find I get the best set by taking the milk up to 180 degrees. I suspect that this does two things: 1) takes care of any stray bacteria that might interfere with the yogurt culture and 2) denatures and concentrates the milk proteins so that it’s easier for the yogurt bacteria to do its thing. After the milk hits 180, I cool it to 115, and pour it into a container for a water bath yogurt warmer. 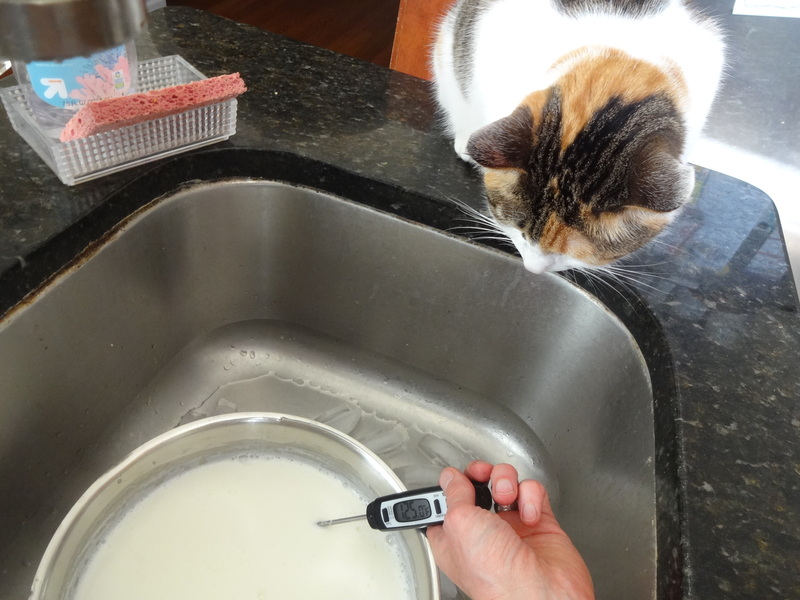 The heating element keeps the water at just the right temperature to gently warm the cultured milk. In about four hours, the yogurt is done, and just needs to cool in the fridge for a couple of hours to be fully set. I recently started culturing buttermilk It started because I wanted to do buttermilk biscuits with breakfast on Sunday during Lent (rather than coffee cake). I’ve kept some around for pancakes and other baking use, and, since it’s so easy to do, well worth it. Again, starting from store-bought, it’s a ratio of about 1:3, that is, fill your container one quarter of the way with buttermilk, then the rest of the way with whole milk [it might work with 2% or skim, but I haven’t tried it] and leave it at room temperature, loosely covered, for at least eight, or up to 12 hours. What you’re looking for is the milk to get thick and start to smell slightly tangy like buttermilk. I’ve heard some people leave it for a full day, but I start to get separation after much more than 8 hours, especially when it’s warm. Nice, thick buttermilk after an 8-hour culture time and a couple of hours in the fridge. I also tested whether the warming the milk to 90 degrees before culturing made a difference (which I had read on a couple of sites), but I found that the straight-from-the fridge milk cultured just as fast as the 90 degree milk. Cheesemaking is also enjoyable, but for now, the return on investment for the time and effort is much better for just the yogurt and buttermilk. If we’re ever in a place again where all we can get is raw, unpasteurized milk from questionable sources, we’ll probably take up cheesemaking again, and add it to our regular repertoire of milk manipulation. Since Yakum had an early basketball game this weekend, I changed up our Saturday pancake tradition and went with oven pancakes. I was first introduced to these by my in-laws (before they were in-laws), where the German Oven Pancake breakfast is a very big deal. They put on a phenomenal spread at my wife’s grandparents’ house, which includes the oven pancakes, cinnamon apples, and lots of other breakfast foods. So, I certainly didn’t put on that level of a spread, but did play with the baking vessel. Most recipes specify a cast iron skillet, and with good reason: the cast iron guarantees a well-crisped crust develops, which contrasts with the buttery-custardy body of the pancake. The challenge is in mass producing, which is difficult when you only have one cast iron skillet (and a relatively small one at that). So, I doubled the recipe and put it in a well buttered 9×13 glass dish. It worked beautifully, puffing way up and getting nicely crisp. My next attempt was a single recipe, but baked in muffin tins to try for mini oven pancakes. The challenge here is getting the right amount of butter in the bottom–you don’t want too much, otherwise it runs everywhere. Not enough and the puff isn’t as good (and they stick like the dickens). Not as successful, but I think this would work well with a tablespoon of cinnamon apples in the middle. The hope is that the pancake would puff up around the filling, making serving easy. Even though they deflate once you take them out of the oven, the real secret to getting them out of the tins is to let them rest at least 10 minutes. Put butter in pan and put in oven to melt the butter–watch carefully so it doesn’t burn. It should take just a couple of minutes. Take out of oven once melted. Combine dry ingredients in mixing bowl (or a measuring cup if you have one large enough). Beat eggs and add milk. Pour wet on dry ingredients, and mix until smooth. Pour in pan, and put back in oven. In a 9 or 10 inch cast iron skillet, this will take about 20 minutes to bake up into a well-puffed oven pancake. Doubled, and put in a 9×13, it also took 20 minutes. The recipe made 18 muffin-tin pancakes, and only took 15 minutes. While a pentaceratops could have been fun (just like the triceratops for their three-year birthday), I went with the stegosaurus and made the plates on the back out of pentagons. 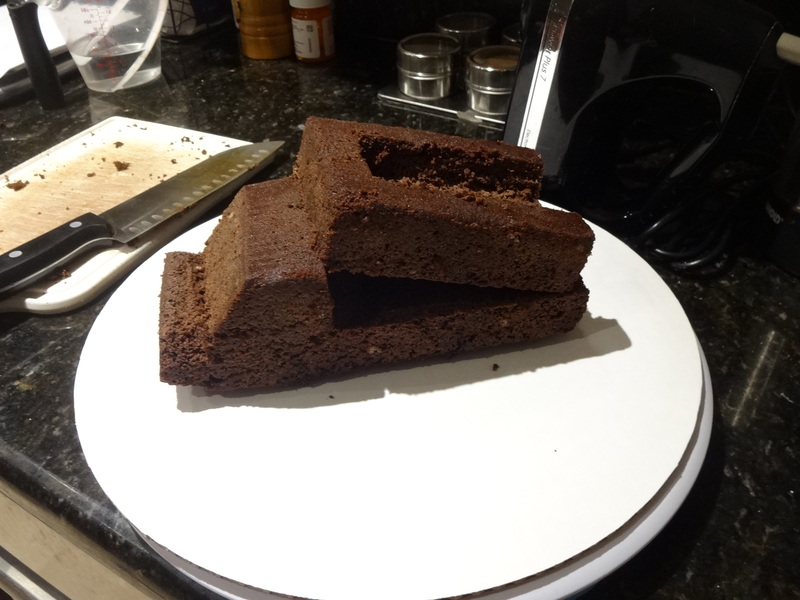 So, the icing is a little sloppy mainly because the cake was frozen when I put it on, and it immediately hardened beyond what I could smooth out. We’ll call it dino-texture. I didn’t want to push my luck with letting it thaw out too much before everything was in place since it took me three tries (and two wooden picks) to get the neck on without it falling. The cake itself is my basic coffee cake recipe, but made with more liquid than usual to tighten up the crumb. Also, I used apple cider rather than milk, and a heavy dose of cinnamon to give it an autumnal spiced cider feel. The cake went over very well with the twins and with Quarta’s godfamily (Tertia’s came for lunch, but we did the cake with dinner). Again, a success, even if a little lacking in execution. Next time I’ll have to work quicker with the icing, and a thinner layer at first, to get it smooth. For the past several years (at least three), I’ve been using a pizza dough modeled after the lazy pizza dough from Smitten Kitchen. I say modeled because I use whole wheat flour, adjusted it some , and think of it as a ratio in bakers’ math, rather than a recipe. The genius of her recipe is in the varying levels of yeast. I haven’t quite gotten that pinned down to something 100 percent reliable, but do have it close enough for my purposes. Mix together until it forms a ball (should take no more than five minutes), then cover and let rise until you need it. Time does all the work of developing the gluten for you. The good news is this is really flexible–if you let this basic amount go for more than six hours, you’re fine (I’ve never let it go more than 12, though–I usually don’t plan that far in advance). This gets me four good sized pizzas (about 10 inch, depending on how thick I make the crust). Forming the crust is a bit of an adventure, or can be. If you’re in a rush, you can divide up the dough (I use about 330g for each crust, based on the 750g flour weight), roll the crust with a rolling pin, and toss it in the oven (at least 500 degrees; hotter is better if you can get it) for about 10-12 minutes, and have dinner. If you want to be a little more artsy about it, you can form disks, let the gluten relax some, then start hand-tossing. I find I get the best results when I use a rolling pin to make sure the disks are an even thickness. If I try to eyeball it, I usually wind up with holes somewhere. The adventure comes when you let the gluten relax too much–then the dough starts drooping like a Dali clock when you try to toss it, and you wind up with holes. Just patch the holes and go for it–it’s still really, really tasty. Around here, broccoli and olive (individually and together) are very popular. Yellow cherry tomatoes cut in half are also a hit, as are sun-dried tomatoes. A recent big favorite is a “Salad pizza”, which the crust, no sauce, and a layer of cheese covered with mixed salad greens (a light dusting of cheese on the greens gets really, really crispy and good). Bake for about 11 minutes, again at 500 (or more), and, after it comes out, hit it with a drizzle of balsamic vinegar. I tried it out a few weeks ago to see if the kids would like it, and now they look forward to it every time. Go figure. 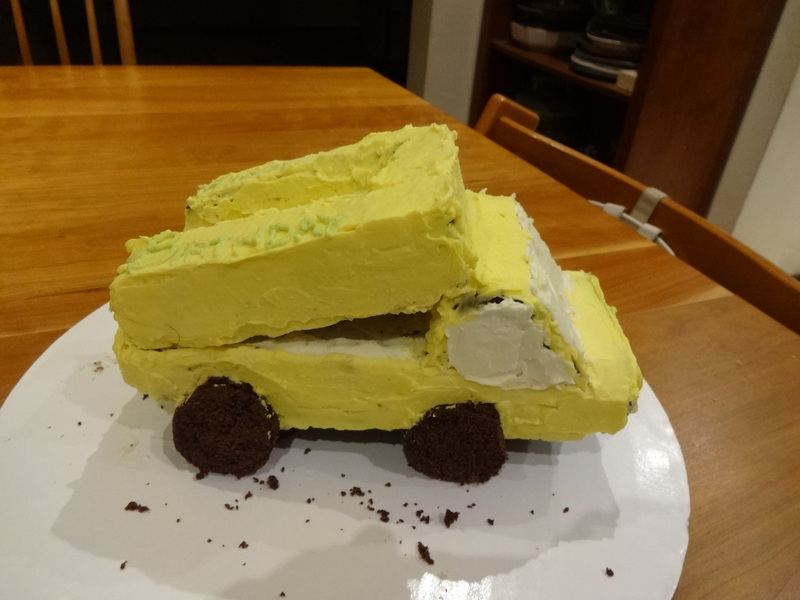 Ikinji wanted a dump truck for his birthday this year. It’s sort of a repeat, since I did one for his third birthday. This was much smaller (fewer anticipated guests), and came together very quickly. I doubled Smitten Kitchen’s Everyday Chocolate Cake recipe, and made one full-sized loaf, 12 cupcakes, and about one quarter of another loaf. 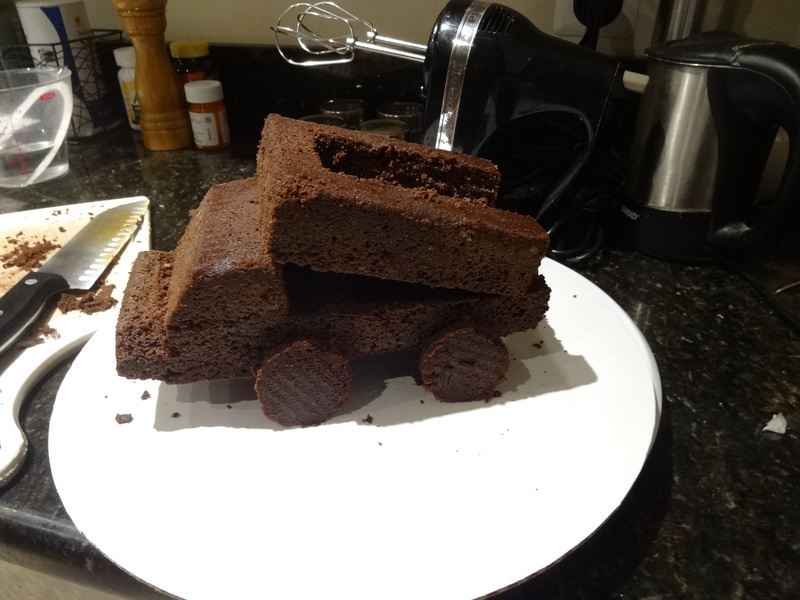 Turned out I only needed one loaf pan worth of cake to make the truck. Some of the cupcakes got eaten at the celebration, but weren’t actually needed. The wheels were cut out from one of the thin scraps left from squaring up the loaf. Supports under the truck body, also cut from scraps, do double duty as a place for the wheels to lean as well as getting the body of the truck off the round. The icing is a slight variation on the Fast and Easy Cream Cheese Icing from Serious Eats. I doubled the recipe, and used half cream cheese and half mascarpone to make it more like the icing on a Whole Foods chantilly cake (which I tried for the first time while we were on vacation in Colorado and celebrated a few birthdays there). This turned out somewhat softer than the target recipe, probably because I used granulated, rather than powdered sugar. I likely could have thickened it up with some corn starch, but it came together pretty well, and held its shape even when room temperature, so no complaints there. 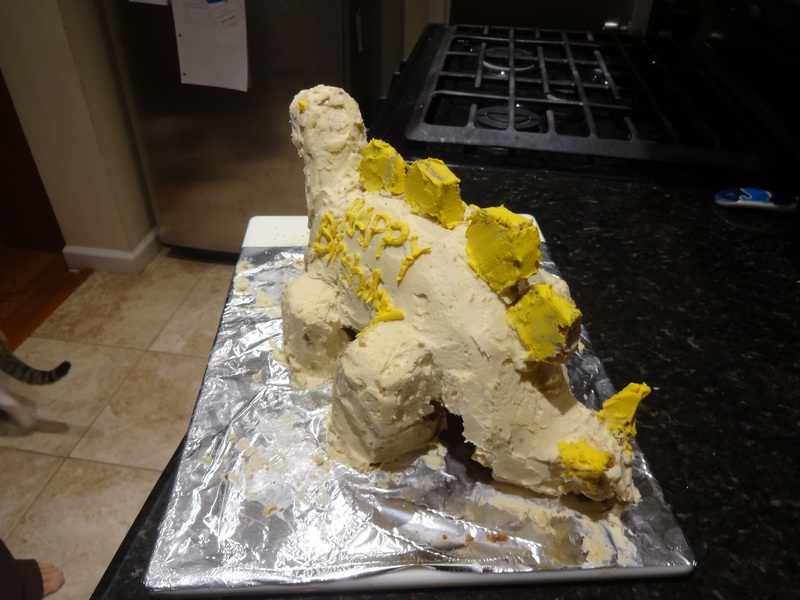 The icing job is a little imprecise since it was so soft, but I’m pretty OK with how it came out. Ikinji was happy, too, so I think this was a success in both looks and taste.